At my school, there are two classes per grade and, for the most part, the same students move up together each year. So, unless there are many new students, my students know each other very well. But, in spite of this, I still like to do "Get-To-Know-You" activities so that I can learn about the students - their tastes, their preferences, their history, their summers, etc. To get to know the students, I have them complete a simply poetry activity consisting of 8 lines. The categories are: 3 words that describe you, Lover of..., Who is able to..., Who feels..., Who wonders..., Who fears..., Who would like to..., and Who dreams...They brainstorm their answers and then transfer them to an acorn template writing page. I have them glue it onto a piece of construction paper and post them on the wall as a festive, informative fall-themed bulletin board. I also complete the activity as a fun and inventive way of introducing myself. Here's the link for Smart Board presentation that I used to introduce myself. As a group bonding activity, I divide the class into three groups and give them each a puzzle to complete. What the students don't know is that I have removed one piece from each puzzle, so it is impossible to complete. We re-group and have a class discussion about how, just as one piece is vital to the puzzle, so is one student an important and valuable member of the class. We all have different bumps and edges, but we have to fit together as a class. I then have them decorate their own puzzle pieces and we fit them together on a display on the wall. All year long, I can silently point to the puzzle pieces when students are being disrespectful to one another or having a disagreement. It reminds them to "treat one another like a valuable puzzle piece." To review our summer vacation highlights, I have the students complete an activity called "Our Summers In Rearview" (rearview because of our travel theme!). Each student decorates a rearview mirror with pictures or words describing their favorite summer vacation memory. They then wrote a paragraph about the memory and I hung them up for Back to School night. Lastly, I have the students complete a shoe glyph about themselves. Glyphs are a fun, creative way for the students to share about themselves and learn about similarities they didn't know they had with fellow classmates. 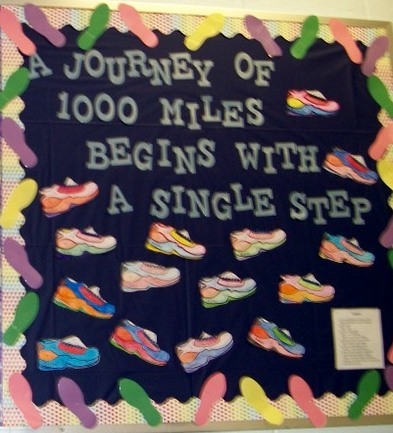 To correspond with our Travel theme, I titled the board "A Journey of 1,000 Miles Begins With A Single Step." We use this board to discuss our goals and to emphasize the importance of persevering despite difficulties. Please let me know if you have any questions, have trouble with links, or need further explanation. Check back soon - more to come! Getting creative with everyday items! Gift Ideas: Back-to-School and Birthdays! Fun and Engaging Science activities!